Just like you and the rest of the family, your pet is likely to eventually get sick and require medical attention. In order to avoid situations where your dog does not get the treatment it needs, you should opt for pet insurance. You might balk at the added expense but when you love your pet and it is clearly a part of the family’s fabric, you should just do it and avoid a heartbreaking and traumatic experience of seeing your dog fade away. When you get a pet insurance, you are basically ensuring that your pet is covered in cases of sickness and accidents for life. You might be surprised at how much medical (and dental) procedures actually cost, but with an insurance policy, it will all be covered. This includes regular check-ups that can cost about $250 for dogs, and procedures much more expensive than this. 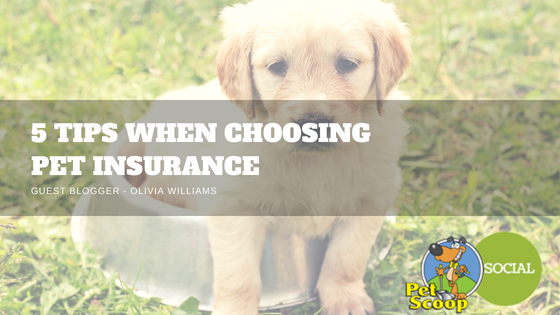 What should you look out for when choosing a pet insurance to buy? Here are 5 tips to ensure that you end up with as comprehensive a policy as possible, but one that is still affordable. This tip does not just go for human health insurance, and in pet insurance, you can definitely end up saving quite a bit of money just by buying coverage as early as possible. Another advantage of this is, of course, that your dog is still very healthy and without any pre-existing conditions that can drive your premium up. If you find an offer that seems too good to be true, then you should definitely dig deeper and do your research. Look at various providers and compare what they offer. Another tip is to look online for reviews. Lastly, you want an insurance provider that is clearly pro-pet and cover as much as possible. A reason for the variety in price is the fact that various insurance policies will differ in terms of what they offer. For example, some might include emergency care or surgeries and even regular check-ups and preventive tests. These will definitely cost you more, but if your pet is also pre-disposed to certain health conditions, it might be completely worthwhile in the end. The most important thing to do when signing any contract or signing up for a service is to understand the terms and conditions fully. The “Fine Print” is infamous for tricking many people into either paying more or accepting much less than what they expect. This is why choosing a pet-oriented insurance company is important, because you know they will most likely prioritize your pet than just maximize profit. If you are still unclear about the terms, call your insurance agent and request a clarification of their policies. You might not realize it, but your veterinarian is a great resource in looking for a great pet insurance. They would know which ones are accredited in their clinic, as well as which ones will have more coverage. So if you want to get great input on the plan or the insurance provider, you should definitely ask around. You might also be able to get a hold of good deals through your vet. At any rate, they should have sufficient information on this matter. Having pet insurance is a must to provide it with long-term care, even if your dog will most likely not get sick in the coming years. Insurance policies and costs of pet care can be enormous in the future, so making the investment now might actually be the best strategy and the best act of love for your four-legged family.